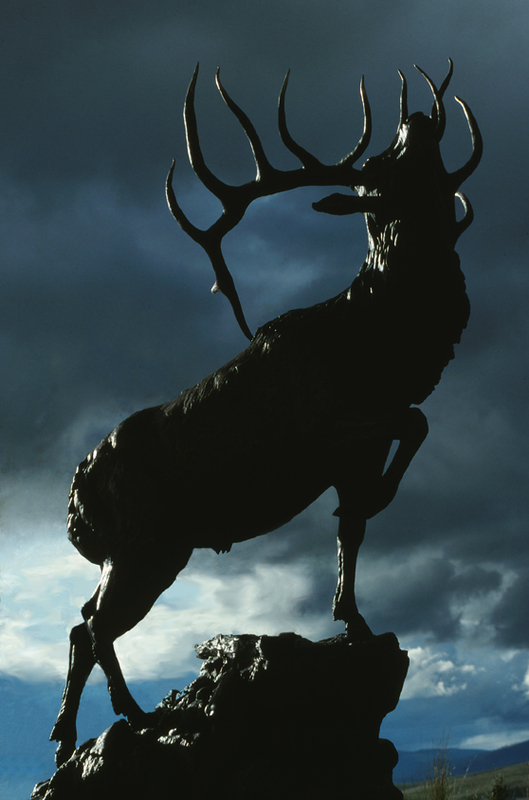 During our last visit to western Montana, we discovered this statue outside the Rocky Mountain Elk Foundation. It stands in front of the foundation’s museum, where visitors can learn about the elk and other wildlife of the region, plus what is being done to help preserve their habitats. After touring the museum, we went outside to get a closer look at this larger-than-life statue. Impressive is a good way to describe it. I had taken a couple of shots, but the statue was in deep shadow from the thick cloud cover. Disappointed, we started packing up the camera gear and decided to return the next day to try for some better photos. As we were finishing up, we looked back and saw the clouds had parted, allowing the sun to shine through and highlight the statue. So I quickly grabbed the camera and tripod. And I was able to compose a few shots before the light disappeared. I sure am glad we were taking our time putting all the photo equipment away! During the holiday season I took some time out to look through my film archives. I have thousands of slides in protective pages and in those little yellow boxes that came back from the processing lab. I didn’t review all of the slides, or I would still be at it come this time next year. Back in the day, before digital cameras became commonplace, we used film cameras. And there were many types of film available, ranging from slow to medium speed (ISO 25-400) slide films to slow to fast speed (ISO 50-800) print films. Film had a quirky trait when exposed for long periods of time. 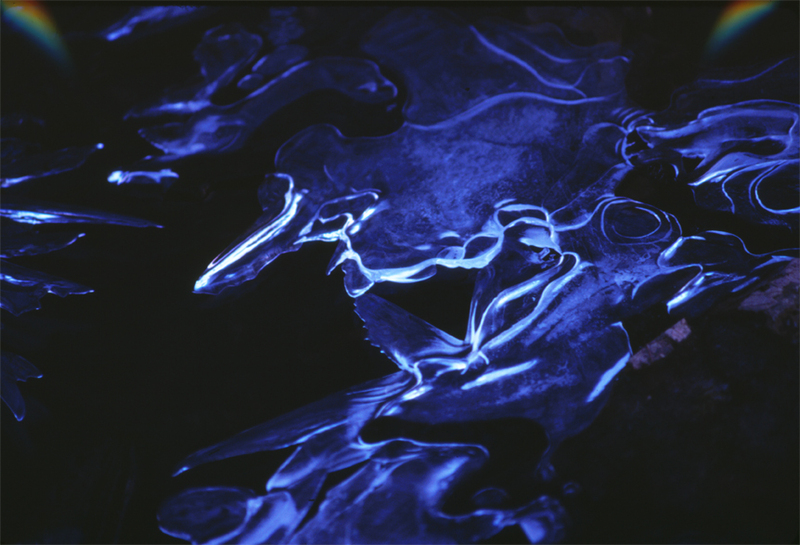 When exposures started to reach the 30 second mark or less, depending on the film and light available, the film’s ability to render true colors would shift throughout the color spectrum. This was known as reciprocity failure and could be used to the photographer’s advantage if abstract images were the main goal. Or the photographer wanted to experiment. The film I used for the photo in this post was Kodachrome 64. The aperture I used was probably f16 or f22 and the shutter speed was most likely around 25 seconds. Available light was minimal since the sun had already set and it was almost dark. This photo is a small portion of an ice patch near the edge of a creek. I took several shots at various locations along the water’s edge. The color shift varied from frame to frame, depending on how long the exposures were. The rainbow lens flare in the upper corners of the frame may have been caused the light reflecting off the water. Because of the long exposure, the color of the ice shifted from white to blue, with spots of lavender, giving it a surreal look. For me, the hardest thing about using film was waiting to see the results from the photo lab. Good or bad. For all you readers of my blog that take time out of your day to comment, like, follow, and offer feedback, I would like to offer a sincere thank-you for your kind words and support. It is greatly appreciated. In the short time I have been a part of the blogger experience, I have travelled the world through your words and photography, and have met some truly wonderful people from all walks of life. 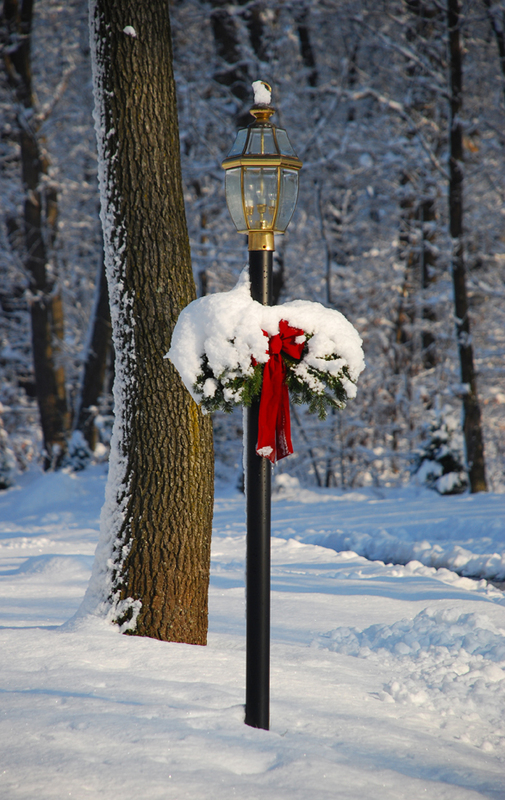 I wish for you and your families, a joyous Christmas and a happy, healthy, and prosperous New Year! One day last week I headed over to a nearby town to photograph the older buildings and storefronts in the shopping district. It was rather brisk outside so I bundled up with a warm coat, hat and gloves. It is December after all. I had photographed several shops that were all decked out for the holidays and I also squeezed in some shopping. Then I came upon something completely unexpected. I wandered into the courtyard of a store that sold whimsical garden sculpture made by local artisans. Some of the items were brightly painted and others were made with rusty metal. Other pieces of garden art were made with a combination of metal and glass. 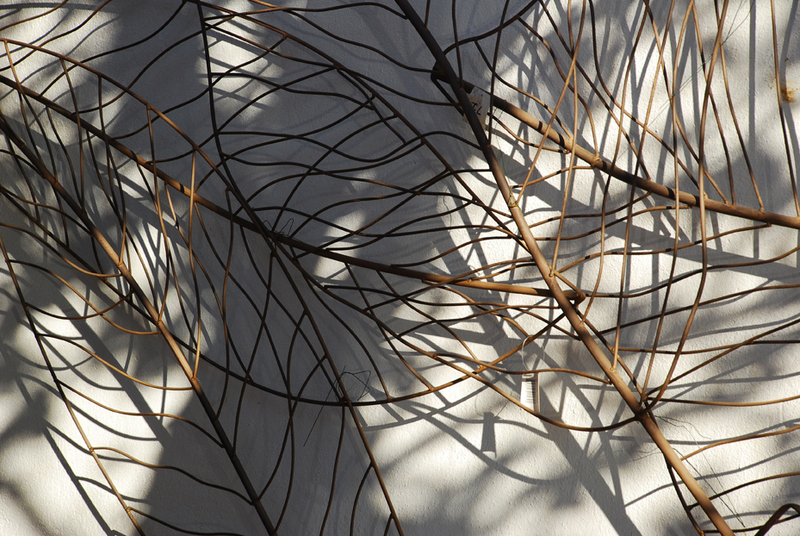 While roaming around the outdoor displays, some interesting shadows on the far stucco wall caught my eye. After closer inspection, I realized the shadows were created by several panels of this rusty wire sculpture leaning against the wall. The multiple panels resembled a jumble of tree branches. Looking at them more closely revealed they were actually an artist’s rendition of gigantic leaves. I really liked the interesting patterns created by the shadows and how the rusty wire contrasted with the white stucco wall. To me, it evoked a tropical feel. Knowing we are headed for these colder temps for the next few months, thinking about garden sculpture and warmer weather sure beats the memories of shoveling that 52 inches of snow we received last year…all in one week. 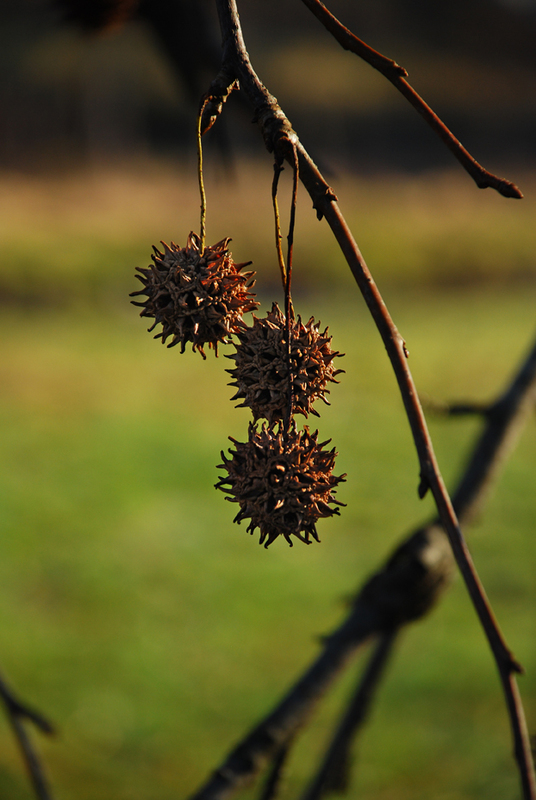 While out on a walk late Saturday afternoon, I came across one of my favorite trees, commonly called the American Sweetgum. They are large species of tree, reaching upwards of 100 feet tall at maturity. Sweetgums are one of the last trees to leaf out in the spring and one of the last to drop leaves in the fall. Its leaves have five to seven lobes similar in shape to a maple, and turn multiple shades of yellow, orange and red in the fall. It also bears prickly seed pods that attach themselves to animals and clothing. I suppose it is nature’s way of transporting seeds away from the host plant. 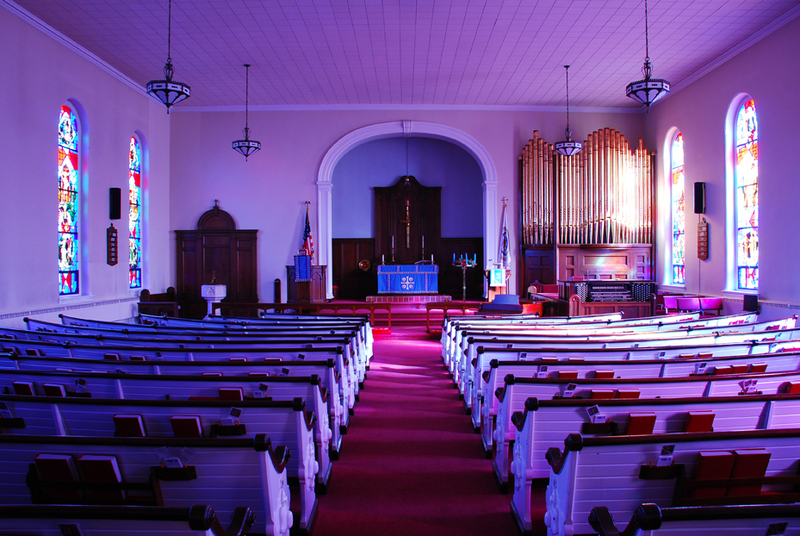 Just in case you are all dying to see what the church looks like, I figured I had better post an image of the interior. I apologize for the hasty post…I was making dinner last night and tried to squeeze in posting while cooking. Not smart to attempt that. By now you have probably noticed I have been on an architecture kick. Lately I have focused (every pun intended) on photographing older churches. I am fascinated with the steeples that reach for the sky, the traditional arched doorways, and the stained glass windows. The stained glass window pictured in my previous post is one of a dozen in a church I recently spent several hours exploring. After photographing the exterior and several statues in the cemetery, I went inside. Upon asking if I could photograph the the interior of the church, I was told to have at it…just don’t break anything. I will say I thought that comment was a little odd, but I went inside anyhow. I finished up the shots of the windows, then began to look for other details, hoping to find a good close-up. The interior was not ornate, and was more simplistic in style. All the pews were angled towards the center aisle. Six hand-made wrought iron and white glass lamps, about two feet in diameter, hung from the ceiling. Wood accent mouldings were minimal, except around the sanctuary, and even that was not fancy. The organ was featured at the front of the church, with its pipes standing out against the stark white of the plaster walls. 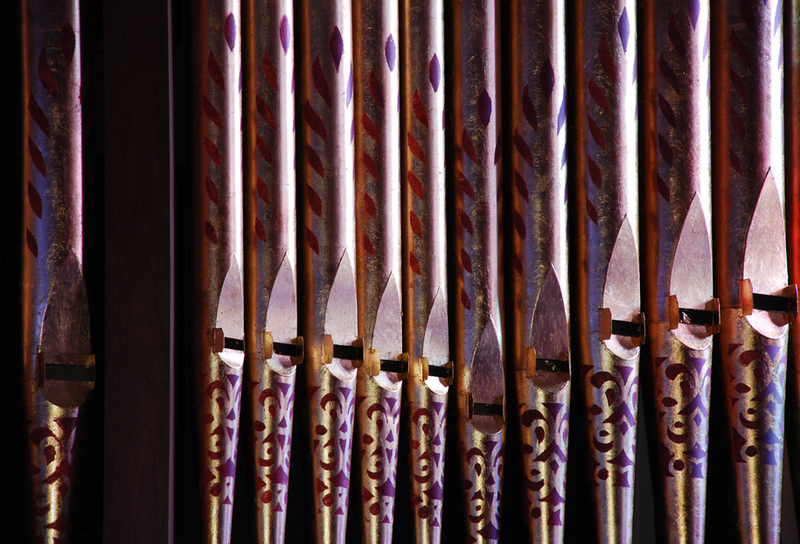 The light filtering through the windows illuminating the organ pipes caught my attention and I knew I wanted to capture the subtleties of light and patterns. I made a number of exposures and each one depicted the pipes in a different way. Some brought out the detail in the shadows while others emphasized the contrast of dark and light within the shapes of the pipes. I chose this photo because I like the metallic texture and tones, and the way the violet decorations are featured. It is more subtle, with less contrast than other exposures, but still has a strong light source, and maintained the drama I wanted to capture.